After the B6900 BCML ended, I did some PDA’s for small projects, but I ended up with some time on my hands. During the B6900 project I got to know John McClintock, software engineering manager, quite well. I also got to know Erv Hauck better. During one of my “unofficial” meetings with John he said “you know Jack, Erv and Bob always wanted to do a Medium Systems stack machine. They joked about a Data Comm. 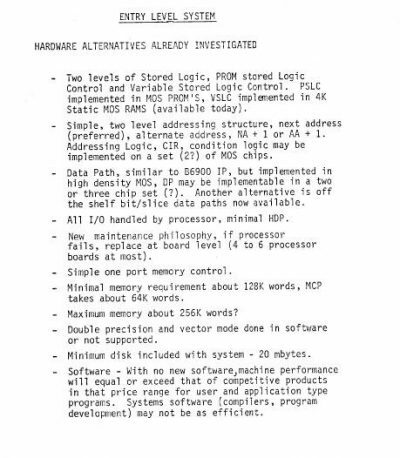 Processor that executed B6700 code. But they could never pencil out the design. It seems the stack architecture is costly by nature. What do you think about that?” Now Tom knew I came from MIT and had experience with VLW (very large word) emulators like “The Black Box”. I told him I felt the machine could be built! He said well, let’s pitch it. I put together a presentation call “Entry Level System – ELS” (Allweiss, J. 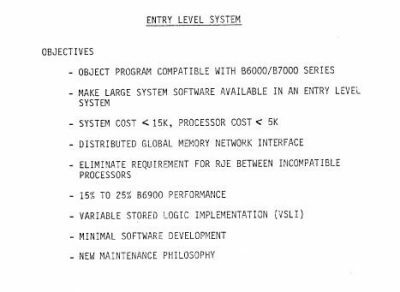 “Entry Level System”, internal Burroughs presentation, 1/23/1978). I presented it to Erv, Don Swanson, Software Engineering Department Manager, and Ron Delaura, Hardware Engineering Department Manager. The engineering managers were interested and asked a lot of good questions. Erv was mostly quiet. After all was said, Erv asked, “Jack, can you really do this?” I told him yes. He said, “Well, you delivered on the Piscataway Memory, you helped us avoid the BCML disaster, so I’ll bet you will deliver on this”. About a week later, Ron Tucker called me into his office; he said “Jack, you’re working for me now, on the new Data Comm. Processor (DCP) project”. I said, “Data Comm. Processor?” He winked, “yea, the one you pitched to Erv last week”. I smiled and knew exactly what he meant. Detroit would never approve the ELS. The machine would be a direct competitor to the Pasadena plant products, and Pasadena had a lot of allies in Detroit. If they got wind of this, it would be killed. Erv would bury this under DCP research. So began the development of the Entry Level System, it did not have a model number, because it was not approved by marketing! The computer was known as the ELS for the next year and a half, at which time it would be blessed by marketing and the corporation as…The B5900.